“When I sing, I want it to be badass, feminine, empowering, and ooze sexuality,” the New York City-based artist says. 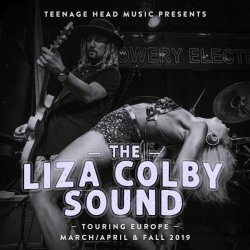 “I want to kick mother#$&ers in the face with rock n’ roll.”The Liza Colby Sound, out of NYC, is known for an aesthetic that harnesses the grit of garage rock, the anthemic power of classic arena rock, the sweat-soaked salvation of a soul revue, and the sneering defiance of punk rock. Part shaman, part seductress, Liza Colby was born to earn the Queen Of Rock N’ Roll mantle. Her music is for sinful Saturday nights, and redemptive Sunday mornings. It’s heartbreak music; it’s music of sexual liberation; it’s music for when it matters most. Liza’s vocals are boldly vulnerable, surrounded and supported by a freight train of power: Charly Roth (drums), Alec Morton (bass), and Jay Shepard (guitar), shaking the rafters and rattling your soul. .Imagine Led Zeppelin at Madison Square Garden meets James Brown at the Apollo. Picture Tina Turner prowling the stage like Iggy Pop with vocals that conjure Aretha Franklin and Humble Pie’s Steve Marriott. Hyperbolic? Nah, come to a show!